For nearly one hundred fifty years, the 12 gauge has been the gauge to beat in the shotgun world. With its versatility, the 12 gauge tops every other shotgun with a manageable recoil and overall effectiveness. Used for hunting, self defense, sport shooting, and law enforcement purposes, this gauge is perfect for a wide variety of shooting applications. 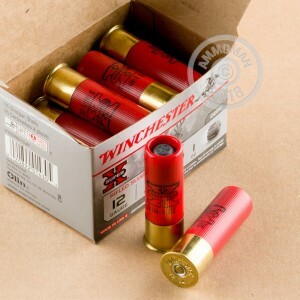 When a company has been around as long as Winchester, you don't have to worry whether their ammo is quality or not. 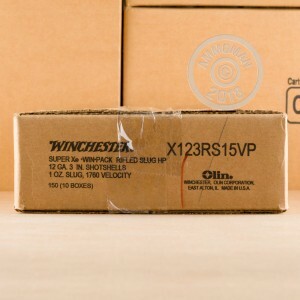 Since 1866, Winchester has earned their reputation as a premier firearms and ammunition manufacturer. These Super-X magnum rifled slugs feature some of Winchester's best components. Each 3" hull carries a 1 oz. rifled slug that leaves the barrel at a magnum velocity of 1,760 feet per second! 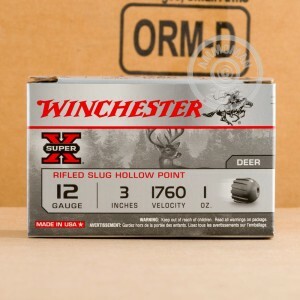 These are perfect shells for deer and boar hunting. This is the good high brass stuff....you get what you pay for.